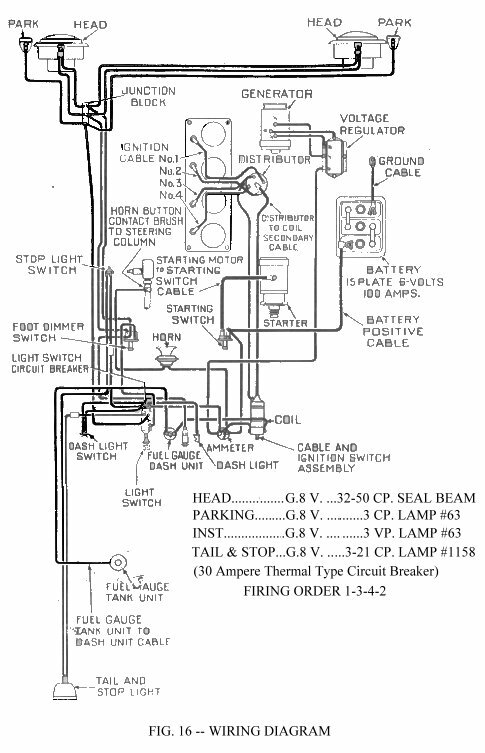 The wiring diagram (Fig. 16) shows the general arrangement of all of the electrical circuits, together with all the units in correct relation to the position in which they are found. Regular inspection of all electrical connections avoids failures in the electrical system. When tracing any one particular circuit, note that the wires have different coloured tracers to identify each individual wire. The battery is of 6-volt, 15-plate, 100-ampere hour capacity. It is located under the hood on a bracket attached to the right hand side rail of the frame and held firmly on the base with a hold-down frame and two studs and wing nuts. Check the battery once a week with a hydrometer and at the same time check the electrolyte level in each cell; add distilled water to maintain the solution level 5/8” (9.52 mm.) above the plates. Avoid overfilling and do not fail to replace the filler caps and tighten securely. If the plates are exposed for any length of time, they can be seriously damaged, therefore, it is important to add enough water to keep the plates covered. A hydrometer reading of 1.285 to 1.300 indicates that the battery is fully charged. Should the reading fall below 1.225, it will be necessary to recharge the battery or else use lights and the battery sparingly until the battery has had an opportunity to build itself up again. Coating the battery terminals with a light grease will protect them from corrosion. The battery must be held securely in place, otherwise it may shift, resulting in loose connections, broken cells or other trouble. Should a sufficiently charged battery fail to crank the engine, it is probably due to loose or corroded terminals or ground connections. The terminal connections should be removed and all corrosion cleaned from them, as well as the posts, to insure proper contact. Clean and tighten the grounded connection on the frame. Clean and tighten the engine ground cable located on the right hand side of the engine Fig. 10. This connection is necessary, due to the rubber engine mountings. The fuel gauge circuit is composed of the indicating unit, mounted on the instrument panel, and the fuel tank unit, connected by a single wire through the ignition switch. Should the gauge fail to register, check all wire connections to be sure they are tight and clean; also be sure both units are well grounded. If, after this check, the gauge does not indicate properly, remove the wire from the tank unit and connect it to a new tank unit which must be grounded to the tank or frame for test. Turn the ignition switch “ON” and move the float arm through its range of travel, watching the dash unit to determine if it indicates correctly. If it fails to do so, the trouble is probably in the dash unit and it should be replaced. Should a new tank unit be unavailable for this test, disconnect the tank unit wire at the instrument panel gauge. Connect one lead of a 6v., 1 CP test light to the instrument panel unit terminal and with the ignition switch “ON” ground the other. If the unit is operating correctly the pointer will move approximately three-quarters across the dial. Do not attempt to repair wither unit; replacement is the only procedure. The wiring of the lighting system is shown in Fig. 16. The lighting circuit is protected by an overload circuit breaker mounted on the back of the main light switch and no replaceable fuse is required. It clicks off and on in the event of a short circuit in the wiring. The upper and lower headlight beams are controlled by a foot switch located on the toe board at the left of the clutch pedal. The main light switch Fig. 18 has three positions. When the switch control knob is all the way in, all lights are turned off. Pulling it out to the first position turns on the parking lights; all out to the second position, the driving lights. Should it be necessary to install a new light switch, refer to the wiring diagram, which indicates the correct wires to install on the several terminals. To remove the switch, loosen the set screw in the side of the switch control knob and remove the knob by unscrewing. The retaining nut may then be removed and the switch removed through the rear of the instrument panel. 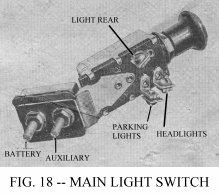 The stoplight switch is of the diaphragm type and is located in the front end of the brake master cylinder. When the switch becomes inoperative, it is necessary to install a new one. 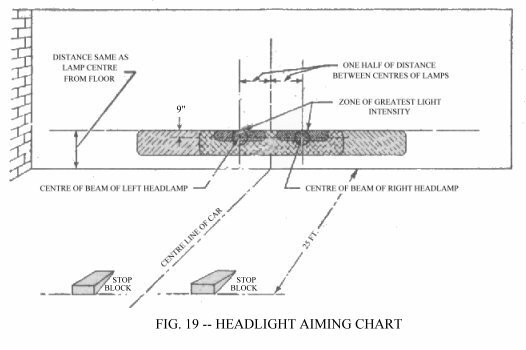 Headlamps may be aimed correctly by using an aiming screen or wall, Fig. 19, providing a clear, level space of 25 feet from the front of the headlights to the screen or wall is available. The screen should be made of light coloured material and should have a black centre line for use in centering the screen with the vehicle. The screen should also have two black vertical lines, one on each side of the centre line at a distance equal to the lamp centres. Place the vehicle on the floor with the tires inflated to the recommended pressure for highway use. Set the vehicle 25 feet from the front of the screen or wall so that the centre line of the vehicle is in line with the centre line on the screen. To position the vehicle, stand at the rear and sight through the windshield down across the cowl and hood. Measure from the floor to the centre of the headlamp and mark a horizontal line on the screen 3 inches less. Turn on the headlamp upper beam, cover one lamp and check the location of the beam on the screen. The centre of the “hot spot” should be centred on the intersection of the vertical and horizontal lines. If the aim is incorrect, remove the headlamp door screw and remove the door, then adjust the two screws in the mounting ring and move the headlamp unit until the beam is correctly aimed, then tighten. Cover the headlamp aimed and adjust the other in the same manner.